The Valdes Peninsula and surrounding coastline are bursting at the seams with varied and unusual wildlife: southern right whales, elephant seals, penguins, orcas and more. Accommodation here is all about getting you out to see the wildlife, from remote, rustic ranches to comfortable tourist hotels. 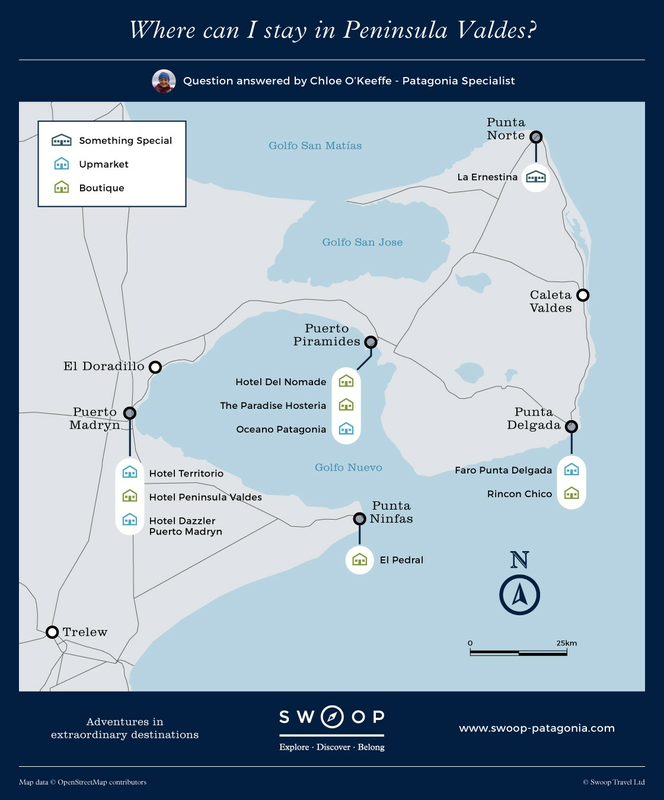 Hotels are concentrated in Puerto Madryn, Puerto Piramides, and then spread out along the coast of the Peninsula. There are fantastic wildlife experiences to be had from hotels in Puerto Madryn, including whale watching and kayaking. For more remote, unique ranches with acres of private land, you'll need to drive at least an hour onto the peninsula, to Puerto Piramides and beyond. There aren't airports on the peninsula itself, so you'll need to fly into Trelew or Puerto Madryn. Flights via Trelew are more regular, but it is around an hour's drive to Puerto Madryn and the wildlife of the coast. Where can I stay in Peninsula Valdes? The gateway to Península Valdés, and a wildlife destination in it's own right, Puerto Madryn is a great place to start your adventure in the Valdes region. The town is safe and welcoming, with long sandy beaches, a bustling port, warm summer temperatures, and of course the arrival of southern right whales from June - December. The whales come so close to the shore that they can be seen from the beaches/cliffs, or on a dedicated boat or kayak excursion. Most hotels in Puerto Madryn are of a fairly standard tourist class, but we do have a few top picks. The most luxurious option in Puerto Madryn - a small hotel of 36 rooms, decorated in simple Patagonian style, with lovely views over the Golfo Nuevo. Cosy fireplaces, big windows and beautiful views make for a lovely base from which to explore the area. If you're feeling lazy you can simply watch the whales cruise by from your bedroom window. The hotel is located on the edge of town, so it's a 20 minute walk or short taxi ride to the bars/ restaurants/ local tour operators, but arguably worth it for the views and comfort of the property. A contemporary mid-range hotel in an excellent location in the heart of town, right on the sea front, with panoramic views of the Golfo Nuevo. It is just a few minutes' walk from the beach, and has a spa, gym and bar. Clean and comfortable, with excellent views of the Golfo Nuevo, the Dazzler is well situated in the heart of town, right on the sea front. It has free wifi as well as a fitness centre and spa. The best rooms are on the higher floors, with balconies to allow you to fully appreciate those sunsets over the bay. Wherever you are staying, ask for a sea view - it's worth the extra cost to wake up to the sight and sounds of the ocean each morning. A tiny town nestled beneath steep, sandy cliffs dropping off into clear blue ocean. Puerto Piramides has a sleepy laid back feel, despite the number of tourists flocking there between June - December seeking southern right whale sightings. The two main streets are filled with hotels, restaurants and tour companies offering whale spotting and other wildlife adventures in the area. You won't find luxury here, but you'll certainly find a comfortable room for a night or two. This eco-lodge is just a five minute walk from Piramides Beach, set amongst lovely gardens, and close to all of the restaurants. The breakfasts are wonderful, including plenty of home made produce, and the staff are extremely friendly and helpful. An old colonial property, set in beautiful gardens, located just a few minutes' walk from Piramides beach. The rooms are tastefully decorated and the on-site restaurant is one of the best in town. An unbeatable location - walk straight on to the beach from your bedroom! This self catering accommodation has stunning views of Piramides beach, and the ocean flanked by dramatic cliffs in the distance. The accommodation is eco-friendly, and has a small kitchenette and sofa area allowing you to prepare meals at your convenience. Wonderful staff, modern design, clean and comfortable rooms. Our top pick for remote, rustic ranches with vast private land to explore. The Valdes Peninsula juts out into the Atlantic ocean, creating two bays which are perfect shelter for the visiting southern right whales between June - December. The peninsula is also frequented year round by orcas, and there are numerous sea lion, penguin and elephant seal colonies here too. Accommodation options on the peninsula itself are mostly fairly remote, rustic ranches - here are our top picks. Estancia La Ernestina is located on private land at Punta Norte, where the orcas come to hunt sea lion pups in March/April. The estancia has a private penguin colony with over 140,000 pairs, as well as sea lions, southern right whales and elephant seals on it's coastline. The top destination in the Valdes area for spending time among elephant seals. The property is located in the south of the peninsula, and has it's own private beach and walking trails taking you within metres of the elephant seals. The accommodation is cosy and comfortable, with views over the steppe. Located in the south of the peninsula, the lighthouse at Punta Delgada is one of the most iconic landmarks on the peninsula, and it's present day lodgings used to house the Navy personnel who looked after the lighthouse. The facilities and accommodations are fairly basic, but clean and comfortable enough - it's really all about where you are and what you can see/do here! There is an elephant seal colony on site, which is a must see between late June- September. It's well worth spending a few nights at one of the more remote ranches to really get under the skin of the region, and have the best wildlife encounters on your doorstep. The region's magnificent wildlife continues further south of Puerto Madryn, and there are some very special hotels dotted along the Atlantic coast. Most of these are fairly remote, and worthy of a few nights' stay to warrant the travel and allow you to fully appreciate the beauty and diversity of the flora and fauna. An original Patagonian farm house, one hour south of Puerto Madryn. This property has a fascinating history, passionate owners, unique design, and is set in a stunning location surrounded by endless pebbled shores, steep cliffs, and abundant wildlife. From this comfortable base you can visit Punta Ninfas lighthouse, spend time with magellanic penguin and elephant seal colonies, observe southern right whales and orcas from the cliffs, or simply relax at the pool or explore the grounds. A wildlife haven well worth the four hour drive from Puerto Madryn. Escape to the wilderness, with no phone reception and only generator powered electricity. Explore petrified forests, endless beaches, and diverse marine life on foot, by horse and by boat. We can arrange transfers for you so that you have nothing to think about on arrival. Alternatively you can flag a taxi at the airport. Some people enjoy the freedom and flexibility of driving themselves, and it can be a great way to cover lots of ground as well. That said, you need to be prepared for bad road conditions and long journeys, so people often prefer the comfort and convenience of pre-arranged transfers instead. What other areas combine well with a stay in the Valdes region? Puerto Madryn and Trelew are just a few hours by plane from Buenos Aires, which connects you to the rest of Argentina. People often like to combine a visit to Valdes with some time in Southern Patagonia, for example some hiking in Los Glaciares National Park, combined with some puma spotting in Torres del Paine, humpback whales in the Chilean Fjords, or King penguins in Tierra del Fuego. Valdes Hotels: How can we help you? We can help you plan and arrange a multi-day activity trip, such as kayaking or whale-watching trip, to fit in with the rest of your plans. We’ll help you arrange the logistics of the trip too, such as how you’ll get to and from the trip departure point and where you’ll stay before and afterwards. Ask about arranging a multi-day activity trip.